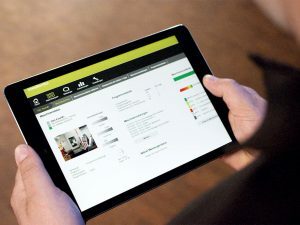 HEIDENHAIN’s New StateMonitor software for TNCs allows control connectivity with PC systems enabling users to view data remotely. Available in English. SCHAUMBURG, IL (October 2017) – HEIDENHAIN CORPORATION announces the availability of the new StateMonitor for CNC manufacturing personnel who are implementing connected systems as part of the Industry 4.0 initiative. This new state-of-the-art software is an option with HEIDENHAIN TNCs and connects with PC systems to allow the user to view data and evaluate control processes remotely and in real-time. For more information, contact HEIDENHAIN’s TNC Product Specialist Julian Renz at (847) 884-4761 or write to us at HEIDENHAIN CORPORATION, 333 E. State Parkway, Schaumburg, IL 60173.